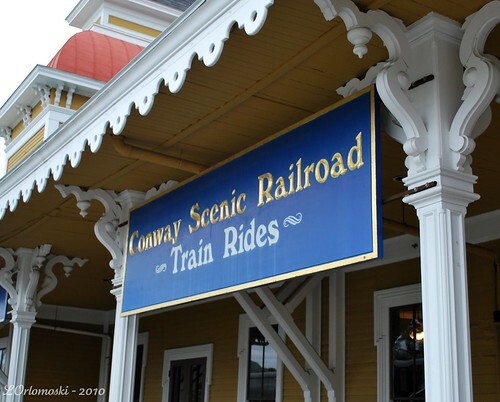 This post has been relocated to The Distracted Wanderer - please click here to take a ride on The Conway Scenic Railroad - Part One. Fantastic photos Linda. I love the ones taken inside that store. The buckets of soap remind me of a store we have here called 'LUSH' - they make all their own soaps, bath bombs etc and the smell is divine! There is something so romantic about trains. beautiful shots. I don't think I could fit one of those jawbreakers in my mouth! I ♥ trains. And so far, your train ride trip looks very picturesque. The rain prediction does not bode well, however. I'd love that five and dime store, too! What a fun day. I too love trains and I would have opted to do this tour too. How fun. I wanna go on that train!!! This looks so fun. You take such wonderful pictures that really capture the essence of the subject. Lovely. I showed the train pics to Hank. He loved them! Now, me? I was "shopping" at the general store through your photos. That looked like a fun place! Gorgeous photo's, so full of color and detail. I'm envious and would have loved seeing all those sights in person. I don't know, I have always loved the sound of a powerful deisel engine. Never a fan of the steam engine. Awsome pics non the less. Fantastic photos! I'm so glad you were able to spend some quality time with your daughter!